Eastern Orthodox – every day's a holiday! 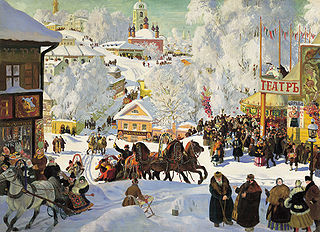 There’s no Mardi Gras or Carnival in Russia. Lent doesn’t descend on Orthodox Christians in one big swoop as in Catholicism, but in a series of events with increasingly strict regulations. Triodion begins a full month before Lent. Two weeks later, Meatfare Sunday marks the last day Orthodox Christians can eat meat until after Easter, aka Pascha. The Sunday after Meatfare is Cheesefare Sunday, the last day for eating dairy products. In Catholic communities the Tuesday before Ash Wednesday is sometimes called Pancake Day, while in Orthodox Russia the whole week before Lent is known as Maslenitsa (Butter Week) or Blini Week (Pancake Week). [Blini has the same root as ‘blintz’.] During Pancake Week Russians empty their pantry of milk, eggs, butter, and other Lent no-no’s, by throwing them into a bowl and mixing them to make pancakes. Russian pancakes are closer to what we would call crepes. The late-Februay/early-March celebration combines Christian theology with an ancient pagan tradition of welcoming the spring. Maslenitsa comes to a close with Vespers on the evening of Cheesefare Sunday. In Orthodox communities this is also known as Forgiveness Sunday. During the evening ceremonies church-goers face and verbally forgive one another for anything the year before. The Orthodox Great Lent begins on a Monday rather than a Wednesday, and is called Clean Monday. Yes, this has all the makings of a great joke, but it’s actually Luke 18:10. 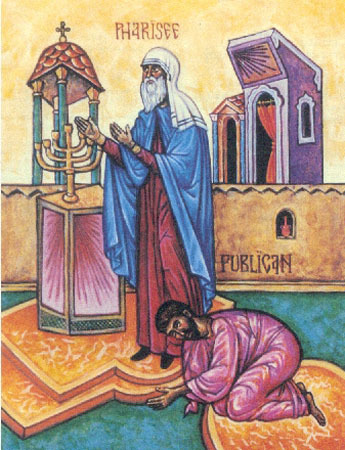 Eastern Orthodox Churches recall the story of the Pharisee and the Publican today, the fourth Sunday before Easter. A different section of the New Testament is read each weekend during Lent. Two men went up to the temple to pray, one a Pharisee and the other a tax collector. The Pharisee stood and prayed thus with himself, ‘God, I thank Thee that I am not like other men—thieves, unjust, adulterers, or even as this tax collector. I fast twice a week; I give a tenth of all that I possess.’ But the tax collector, standing far off, would not so much as raise his eyes to heaven, but beat his breast, saying, ‘God, be merciful to me a sinner!’ I tell you, this man went down to his house justified rather than the other; for everyone who exalts himself will be humbled, and he who humbles himself will be exalted. Next weekend churches focus upon the Return of the Prodigal Son and the Commemoration of the Dead. The following weekend: the Last Judgment and the Expulsion of Adam and Eve. Well, we’ve got the needle. All we need is a man rich enough to clone a foot-tall dwarf camel! The story goes that up until the late tenth century, much of Russia and Byzantium celebrated the New Year during the spring equinox. That changed in 988 AD when Basil the “Bulgar-slayer” Porphyrogenitus* introduced the Byzantine Calendar to the Eastern Roman Empire. The Byzantine Calendar was like the Julian Calendar except it began on September 1, and its “Year One” was 5509 BC—the year historians calculated as the creation of the world (Anno Mundi) according to genealogies of the Bible, from Adam to Jesus. It took roughly four centuries for the “September 1st” New Year to make its way into the heart of Russia. And just when the Russians were getting used to that, Peter the Great switched to the Julian Calendar, moving New Year’s to January 1 in 1700 AD. It was only a matter of 50 years until all of Protestant Europe stopped using the Julian Calendar altogether, in favor of the Catholic Europe’s Gregorian Calendar, leaving Russia and the Orthodox Church out in the cold. It wasn’t until 1918 that Lenin finally moved Russia to the Gregorian calendar. But the Soviet Union couldn’t let sleeping dogs lie. 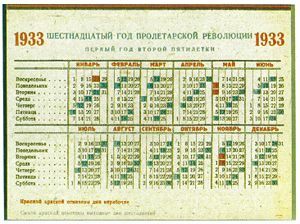 During the 1930s they declared war on the number 7, dividing months into five six-day weeks. Fortunately, this decade-long practical joke on the Russian people ended in June 1940. Today we also celebrate day 2,454,846 in the Julian Day system—the number of days that have passed since noon, Greenwich Mean Time, January 1, 4713 BC. The Julian Day system was developed by Joseph Scalizer in 1582, and is used mainly by astronomers and people with way too much time on their hands. It’s called the Dormition, or the “falling asleep”. On its own, falling asleep might not sound like ample reason for a feast, no matter how much you like to sleep, but it’s a very big deal in the Orthodox Church. That’s because Dormition in this case refers to the departure from earth and subsequent ascension of Theotokos, ie. “god-bearer”, the Virgin Mary. In Roman Catholicism, it’s known as the Assumption of the Virgin Mary. Although the Assumption is celebrated on August 15, in the Eastern Orthodox Calendar that equates to today, August 28th. The Dormition is a major feast in Eastern Christianity, so major it’s preceded by a strict two-week fasting period. During the fast Orthodox Christians refrain from eating red meat, fish, poultry, and dairy products. The Feast of the Transfiguration falls right in the middle of the fast (How’s that for confusion?) during which time fasters are allowed to go wild and eat fish. 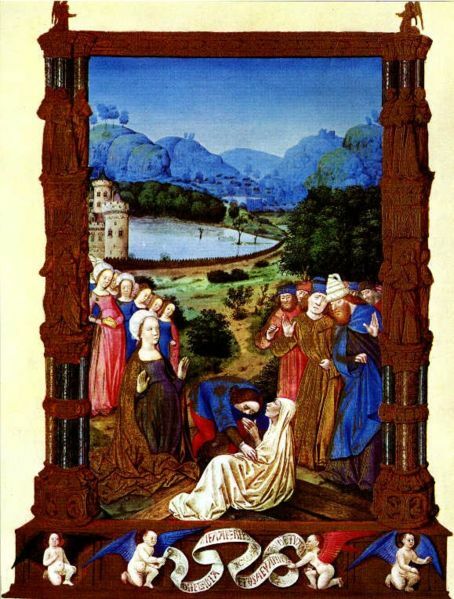 Already by the second century, Christians had begun to circulate stories of the Virgin’s life before the Annunciation, but evidence of a similar concern with the details of her life after her son’s ascension does not emerge for several more centuries. 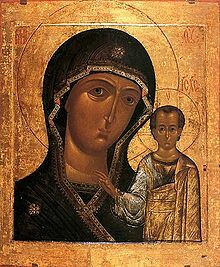 Between those epochs we have the foundation of the written history of the Dormition. According to Orthodox tradition, Mary died a natural death, the same as any mortal. Her soul was received by Christ. All the Apostles except Thomas were present at her death. Three days later, Thomas (always the odd man out) finally arrived and pleaded with his fellow Apostles to see her once more. Like Son, like Mother. Mary’s body was resurrected and ascended into heaven on the third day after her death. The transfiguration, celebrated by the Roman Catholic Church each year on August 6, refers to what is perhaps history’s greatest Kodak moment: Jesus talking with the prophets Moses and Elijah (Elias) on the peak of Mount Tabor in 27AD. Only the Apostles Peter, John and James witnessed the event, and unfortunately none of them posted pics it to their myspace account. 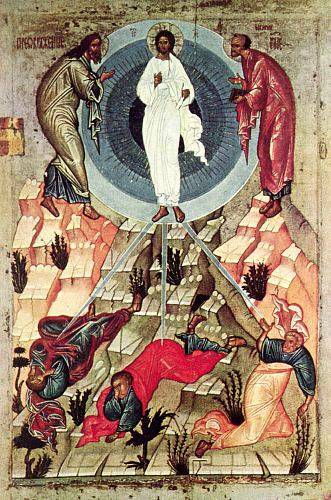 (If you have a photograph of the Transfiguration, please email it to us!) Nor do we have any record of what was discussed, for the disciples were too distant to hear the conversation, and Jesus forbade them from even mentioned the event until after the Son of Man had risen. What we do know comes from nearly identical versions in the Gospels of Matthew, Mark and Luke. Jesus led the three Apostles to the mountaintop where “His face shone like the sun and his clothes became as white as the light,” says Mark. “Just then there appeared before them Moses and Elijah, talking with Jesus,” continues Matthew. Peter offered to set up three shelters, one for each prophet, but as he spoke a cloud enveloped them. “A voice came from the cloud, saying, ‘This is my Son, whom I have chosen; listen to him,” concludes Luke. When the Disciples looked again, the two prophets had disappeared. Theologians have debated the literalness of the Transfiguration. 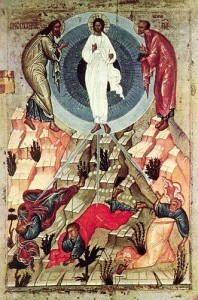 Most take the Transfiguration as a factual description of an actual event, especially in the Orthodox Church. Others view it as an allegory. One interpretation of the Transfiguration is that Moses represents the Law and Elijah represents the Prophets. Elijah meanwhile, may have represented the Prophets. Elijah is a prophet in the Jewish, Christian and Muslim faiths (“Ilyas” in Islam), but occupies very little space in any of those religions’ spiritual texts. One of his claims to fame was that he was said to have never died. Instead he was taken up to heaven in a chariot of fire. It was believed his future appearance on Earth would be an imminent predictor of the coming of the Messiah. In the New Testament, folks take St. John the Baptist for Elijah. It’s not an official holiday yet, but with the Russian Orthodox Church’s beatification of the last Russian Tsar and his family in 2000, the Romanovs do have their own saint day—July 17—the anniversary of the day they were executed in 1918. 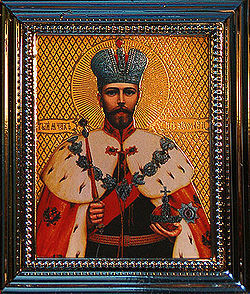 Nicholas II, the last Russian Tsar, is a touchy subject in the former Soviet Union. He and his family met a horrifying end at the hands of revolutionaries who banned all religion in Russia except worship of the state. But Russians also recall that Nicholas’s decisions wrought unrecoverable damage to one of the strongest empires on earth. Nicholas’ reign was troubled from the get-go. Four days after his coronation in 1896, a panic during his banquet festivities in Moscow resulted in the trampling-to-death of nearly 1,400 celebrants. Though not the Tsar’s fault, Nicholas’ decision to attend a ball at the French Embassy that night anyway did not win kudos from the Russian people. The following decade saw the tragic massacre known as Bloody Sunday, where striking workers and their families hoping to bring a petition to Nicholas II in St. Petersburg were instead gunned down by police. Public reaction to Bloody Sunday led the Tsar to allocate power to the political body known as the Duma. But the end of his reign must be attributed to his refusal to pull out of World War I, even when his country was on the verge of total political and economic collapse. Mass mutinies led Nicholas to suspend the Duma, but members of the Duma and the Soviet, as well as leading generals, demanded Nicholas’s abdication. By 1917, the Tsar’s most loyal troops were lying under the sod of western battlefields; he abdicated in March. Russia’s short-lived democratic government shielded the Romanovs in St. Petersburg, but during the October Revolution, that government was ousted by the Bolsheviks. The Bolsheviks wanted to leave no chance that Russia would return to the old aristocratic system. On July 17, 1918, the Bolsheviks gunned down Nicholas and the entire royal family in a cellar in St. Petersberg, including his wife Alexandra, their four daughters, and their 14 year-old son Alexei. On July 17, 1998, eighty years to the day after their deaths, the royal family was interred in St. Peter and Paul Cathedral in St. Petersburg. They’re considered saints after the 2000 beatification, but not martyrs. To be a martyr of the Church, one’s death must be a direct result of one’s Christian faith. The Romanovs are honored instead as “Passion bearers”—those who met death in a Christ-like way. In March the Protestant and Catholic Churches celebrated Easter; last week Jehovah’s Witnesses observed the Memorial of Christ’s Death; but today the Eastern Orthodox Church gets the last word, celebrating the Resurrection in what is known in many countries as Pascha. The Orthodox Paschal cycle repeats every 19 years, as opposed to the Western Paschal cycle, which repeats every 84 years. One proviso of the Orthodox date of Pascha is that it cannot fall before the Jewish Passover, which partly accounts for the different dates when Easter is celebrated. In the Gospels the Last Supper is described as a Passover meal, while St. John records the death of Christ as the same hour in which paschal lambs were sacrificed in preparation for the holiday. The latter approach won out, which is why virtually all Churches celebrate Pascha on Sunday. The site of Jesus’ burial and resurrection is believed to be the present day site of the Church of the Holy Sepulchre in Jerusalem.